Many iPad owners like using a service like Box or Dropbox as a network file share for work, where all files are stored and accessible from any device. You can move files from these cloud storage services into Pages, Docs, or Word, but with only a few exceptions you can’t open or save back to them directly, making version control tricky and cumbersome. 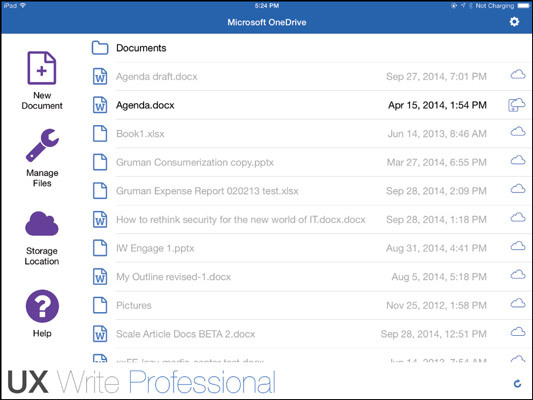 The $24.99 UX Write Professional doesn’t have that limitation: In addition to working with files on your iPad, it can open files from and save them to the Box, Dropbox, Google Drive, and Microsoft OneDrive services, as well as to any Internet-accessible file server that uses the WebDAV protocol. It also has some features that Pages, Docs, and Word don’t. You can get the free version of UX Write and subscribe to the Pro features for $1 per month. That’s a great way to check out whether UX Write Pro is worth its full $24.99 price for your needs. Just note that the free UX Write is not very useful unless you subscribe or buy the Pro features, which you must do from within UX Write as an in-app purchase. If you tap a service that you haven’t signed into before, UX Write Pro will ask for your sign-in credentials for that service and then save them for future use. You need a live Internet connection to work with cloud storage services or a WebDAV server. When you open a storage location, you see a list of existing files and folders. Navigate to folders by tapping them; navigate back a level by tapping the < button at the upper left of the screen. Tap a filename to open it, and tap the + button at the upper right of the screen to create a new document or a new folder. A cloud icon to the right of a filename means that the file needs to be downloaded to your iPad so that you can work on it; after it’s downloaded, the icon changes to one of a floppy disk (remember those?) and a cloud, so you know the file is stored on your iPad but is also synced to the cloud storage service. UX Write Pro can open only two file formats: HTML and Microsoft Word. And for Word, it can open only the 2007 (or later) file format, which has the filename extension .docx, not the earlier Word 97 format (.doc). You can use more than one cloud storage service in UX Write Pro. Tap the Storage Location button at the left side of the screen to open the form displaying locations; then tap the icon for the one you want to work in now. What you can’t do is work in multiple locations simultaneously; you have to move among them one at a time. To refresh the folder and file list, tap the Refresh button (the curved-arrow icon) at the lower right of the screen. Tapping that button updates the list with any changes made on the cloud storage service, such as from another device. Tap the Manage Files button at the left side of the screen. Select the files and/or folders you want to work with by tapping the circles to the left of their names. Tap Select All at the bottom right of the screen to select everything displayed. Tap the button at the bottom of the screen for the desired function: New Folder, Rename, Copy, Move, or Delete. If you tap Copy or Move, a window appears showing available folders; tap the destination folder and then Move Here, or tap Cancel to cancel the operation. If you tap New Folder, any selected files are not moved into it; you have to select them again and use Copy or Move to put files in the new folder. Tap Done when you’re, um, done.